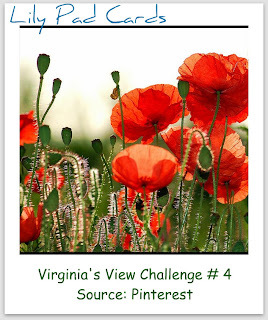 Here is my entry for current Virginia`s View Challenge. The photo of poppies is so beautiful that I created this card in an instant. I used HA Lace background stamp, but I colored it with red marker to get this partial image. Thanks for stopping by. Tale voščilnica je nastala na podlagi krasne fotografije makov pri Virginia`s View izzivu. Uporabila sem HA Lace štampiljko za ozadja, a sem z rdečim flomastrom pobarvala le en del, da sem dobila vzpenjajoče se rože. Preden sem odtisnila, sem enkrat pošpricala z vodo, ker se med barvanjem flomaster hitro suši. Super ideja, kako uporabit isto štampiljko na dva načina. Lepa čestitka je nastala. Vsekakor si se lotila izziva na zelo zanimiv način in ustvarila krasno čipkasto čestitko. 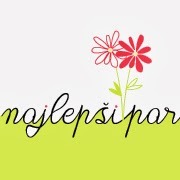 Zelo lepo, če bi jo hotela kupit od tebe bi imela grozen problem, ker so mi vse lepe!!! WHAT!!! I have this stamp and it's one of my fave but I never ever thought of doing this with it. OH how I LOVE IT...AMAZING!!! wow!ja že spet!! res si iznajdljiva in polna domišljije!!! Krasno!!! What a fantastic idea, Tina! Thanks so much for playing with us again at Lily Pad Cards! WOW, you really knocked this one out of the park! It's simply gorgeous! What a beautiful design, and what a clever way to use the Lace stamp. (This Lace stamp is another stamp I absolutely love. I need to revisit it.) Thanks for the wonderful inspiration, my friend! WOW Tina this is so GORGE and so creative just to colour a portion of the lace stamp!! LOVE IT!! Fantastična čestitka...čipke so kot taprave. Wow! Wow! I love that green ribbon at the bottom! That stamp is so pretty!